On the first floor (no lift) of 'Résidence Maylis' lovely appartment of 50m². 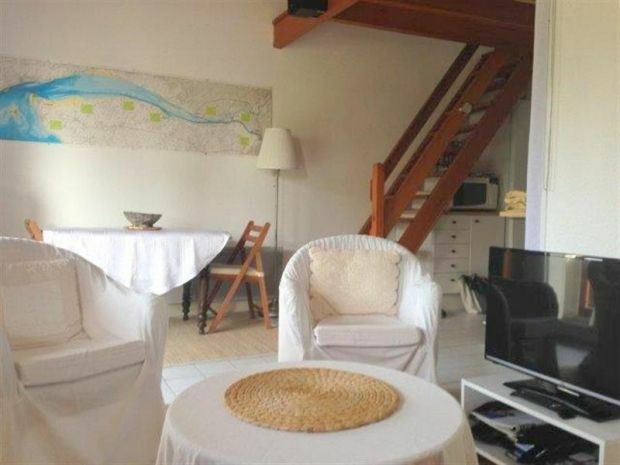 Located 300m from the beach of Le Platin and 800m from shops. Open plan kitchen (2 ring ceramic hob, oven, microwave, fridge-freezer, dishwasher, w.machine). Dining room opening onto the balcony. Lounge area (TV + DVD player). Shower room. WC. Upstairs: Mezzanine bedroom with bed of 160 and hanging space. Twin bedroom with two single beds of 90 which can be joined to make a double + chest of drawers. OUTDOOR FURNITURE - PRIVATE PARKING N°39 - HI-FI. 2 CHAISES LONGUES. Sleeps 4.